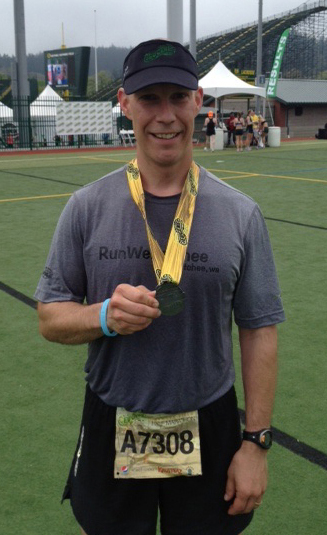 Joel Rhyner poses with his Eugene Half-Marathon finishers medal after completing the April 29 race. The back end of Hayward Field is in the distance. You may be asking yourself, why run it if you are not prepared? Well, I felt I could not pass up a chance to run in Eugene, the mecca for distance running in the United States since the early 1970s. The day before the race, I did a short run on the famous Pre’s Trail, which is a 4-mile wood chip trail near the University of Oregon campus. The trail pays homage to Steve Prefontaine, probably the most famous UO alumni runner and considered one of the great American long-distance runners of all-time. As I ran, it was quiet and the only sounds I heard were my footsteps and my breathing. But my breathing was different than usual, it was more rhythmic and I was actually breathing a word … Pre, Pre, Pre … I know it sounds crazy, but I felt a surreal sense of effortless running and that something more powerful was guiding me on my run. Hmmm … After my run, my knee was a little sore, but I felt I was ready as I would ever be. 5 a.m., race day. I went through my usual pre-run routine in my hotel room, drinking 12 ounces of water, taking my usual supplements, eating some carbs and protein, getting dressed, etc., but something felt different. My knee was not sore, which it typically it is in the mornings. My legs felt fresh and flexible, again not the usual. I picked up my friend Steve and we went to park near the start. We found a parking spot and there was a short walk to the start area. The morning was cool and there was tons of energy from all the runners. As we neared the start, the hallowed stadium of Hayward Field came into view. We walked into the stadium and I was in awe. This is the place where so many track and field legends over the years have ran! OMG! 7 a.m., it is go time. As I stood with 8,500 other runners, I felt so good. Everything was perfect. My legs felt fresh and ready. Let’s do this! The gun sounded and we were off. First mile at 7:30 pace. Knee felt good. Usually it hurts for the first 20 minutes and then the pain eases. But today, nothing. Mile 3, 22 minutes and change … still feeling great. The energy from the crowd and other runners is amazing. I was “racing” again! Not to get too excited as I had 10 miles to go … The first 6 miles went by and I was still on 7 minute pace. I was thinking to myself, ‘This is going much better than I expected.’ I had found a nice group to run with and we were clicking off the miles. I passed my friend Steve at mile 9 and gave him the thumbs up, knowing that this is where things were going to get interesting. See, the longest I had run in the past year is 9 miles. As I hit mile 10 and I looked at my watch, it said 1:10. I was still on pace for a pretty quick race, but this last 5k was going to have to be my best. I was pacing with another runner and he and I exchanged some quick words of encouragement to each other and set off to finish strong. Mile 11 to 12 is along a paved path, adjacent to Pre’s Trail. I suddenly felt this surreal sense of calm and that funny breathing pattern I had the day before happened again! Silently, my breathing sounded like the word, Pre, again. … Pre, Pre … It was crazy, but it was at that moment that I knew this was a special day for me — fastest time in more than four years, racing again after a one-year hiatus and the thought of possibly not running or racing again. It was all coming together and I felt that there was a higher power guiding me over those last few miles. Mile 12. It was now or never. 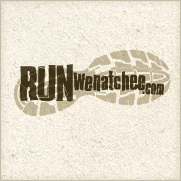 I had put a small gap on the Canby, Ore., runner I had been running with over the last few miles and we were headed directly toward the finish. I thought to myself, ‘This is just like our Tuesday track workouts; run the last mile repeat as good as your first!’ As I approached a half-mile to go, I could see Hayward and start to feel its pull. The strength I was gathering was amazing. I had to keep my emotions in check and make sure I did not pull a hamstring in the last few hundred yards! Then, there it was, the final 200 meters on the track at Hayward. Once I hit the track, I knew this was where I was supposed to be. It felt like I was floating, my feet barely touching the ground. This is how Steve Prefontaine must have felt as he rounded this same corner many times and many years ago. … As I came down the straightaway and into the finish chute, I raised my arms in celebration for my 1:30:58, not bad for a 44-year-old, oft-injured runner. 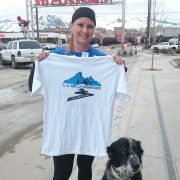 It was my second-fastest half marathon in the last 5 years. But more importantly, I had felt something in this day, at this place, that I had never felt before. I was running in the footsteps of legends. Congrats, Joel. Sounds like an awesome day for you. So glad you’re back to running and racing. This post gave me goosebumps as I read it. This inspires me to go faster and push harder!